These candied cherries can be incorporated in delicious desserts. This page contains recipes using cordial cherries. Preheat oven to 350 degrees F. Beat eggs on high speed until foamy, about 2 minutes. Blend water and oil with eggs. Slowly add cake mix and jell-o, beating constantly. Add maraschino cherries juice and beat for 2 additional minutes. Gently stir maraschino cherries into the batter. Pour batter into a greased and floured 12 cup bundt cake pan and bake for approximately 45 minutes or until cake tester comes out clean. When cool, ice with chocolate glaze. For the glaze: In a small saucepan, combine chocolate and evaporated milk. Cook and stir over low heat until mixture comes to a boil. Lower heat and cook gently for 3 to 5 minutes, stirring constantly until thickened. Cool, stirring occasionally. 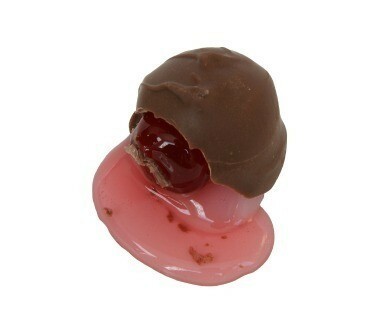 Family has given us three boxes of cheap chocolate-covered cherries, also known as cherry cordials. You know, the ones sold at Christmas time in an oblong box, with several candies inside nestled in two plastic trays. They're shaped like a bon-bon with a chocolate shell, super-sweet filling and cherry inside. We once liked candies similar to these, but in recent years they have not appealed to us. I suppose they have a more cheap taste than they once did, or mayhap it is just that our tastes have changed, or something. We just can't enjoy eating them now, or at least not this type with its thick white and almost grainy center. These seem to be a particularly cheap brand. (We would probably still enjoy a better brand.) Family had good intentions and was just being nostalgic, of course. Any ideas for recipes to use these? Seems like they might be good in a cake or something. Maybe cooked inside a cupcake? Here is a recipe for ice cream. I haven't tried it, but it looks good.